Josh Elliott rode for the Tyco BMW team in the Superstock 1000 Championship in 2016 after clinching the title the previous season. Ballinamallard Bullet Josh Elliott remains hopeful of fulfilling his ambition of landing a coveted ride in the MCE British Superbike Championship this season. The 2015 National Superstock 1000 champion has been drafted into Northern Ireland’s Tyco BMW team for this weekend’s British championship round at Knockhill in Scotland as a replacement for Ian Hutchinson, who sustained a broken left femur following a crash in the Senior TT last Friday. Elliott rode for the Moneymore-based team in the Superstock class last season following his title triumph the previous year on the Morello Kawasaki. However, he was unable to hit the same heights in 2016 on the Tyco BMW S1000RR, finishing fifth in the championship standings and claiming his sole win at Oulton Park. The 23-year-old failed to secure a ride this year, joining fellow top talent Andy Reid on the sidelines as team bosses demanded budgets in excess of £45,000 to pay their way in. 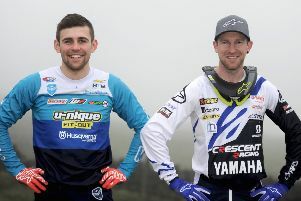 Clogher’s Keith Farmer and Alastair Seeley also fell into the same bracket before both riders managed to tie up late deals. With Hutchinson injured, the door has opened for Elliott once again and the articulate Ulsterman is optimistic he could yet still bag a BSB ride for the remainder of the season. “I haven’t raced since the final round of the Superstock championship at Brands Hatch last year,” Elliott told the News Letter. “I’ve kept myself in shape and the main thing will be finding that sharpness again after being away for so long. It’ll be a matter of adjusting to the speed again and trying to get myself into a position to push for a fast lap time. “To be honest, I was kind of expecting the call after Hutchy’s crash at the TT, although I didn’t think it would happen in time for this round. On his desire to break into British Superbikes, Elliott said joining the series remains the next logical step in his career. “I won the Superstock 1000 Championship in 2015 and I really didn't get much out of it to be honest,” he said. “I got a ride in the same championship the following year with Tyco BMW and essentially now for my career I need to be on a Superbike. “BSB is my main goal because I don’t feel as if I have anything to prove in the Superstock 1000 class. This ride is about getting some track time under my belt and hopefully something will come up. Tyco BMW team manager Philip Neill speaks highly of Elliott, describing the young prospect as a ‘class act’. “Obviously our first thoughts are with Hutchy as he recovers from the leg injuries he sustained during the Senior TT on the Isle of Man. Thankfully he is now on the road to recovery,” he said. “With Hutchy missing from action we are delighted to offer Josh the opportunity to re-join Tyco BMW for this weekend’s Superstock races.